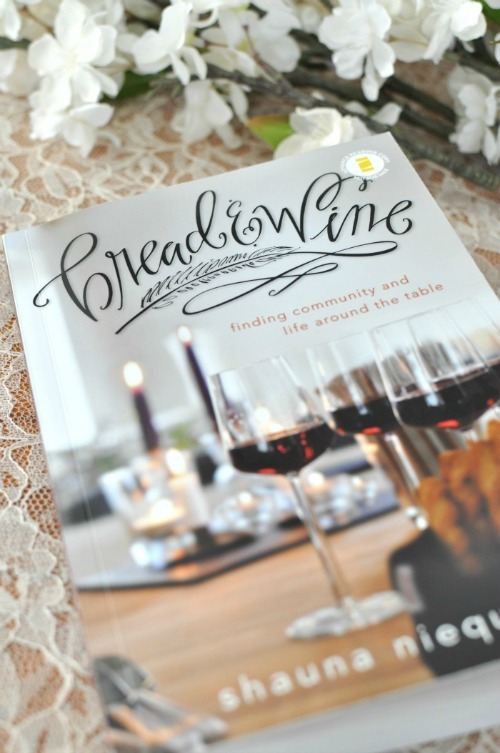 A few weeks ago I shared about reading Shauna Niequist's newest book, Bread & Wine. It isn't often I come across a book that nourishes both body and soul brilliantly. This one does. Filled with simple yet decadent recipes wrapping up almost every chapter, I waited all of 10 minutes after reading chapter one before digging thru my freezer for a bag of wild blueberries. Half an hour later Ev and I were happily lounging on our shady back deck sharing a bowl of greek yogurt topped with syrupy, crunchy blueberry crisp. Heaven. We had it every day that week. Funny thing is, even though it has a handful of perfectly lovely, simple recipes, this book is nothing like a cookbook. At all. It's more a labor of love. It's food and faith and family dripping from every page. It's heartbreak, redemption, failures and confessions set against a backdrop of risotto and bacon-wrapped dates. It's tangible love. It's communion. It's beautiful words and beautiful meals shared with vulnerability and honesty, and it inspires you. She inspires you. I have to admit, the simple pleasure of reading has become quite sacred around here. With a tiny girl demanding every last ounce of my attention, long moments of sinking into a chair at leisure to drink in the pages of a book are rare. But when those moments do happen, they are rich and wonderful. I think their rarity made this book even richer. Occasionally during nap time, even though I felt the gnawing compulsion to race around scrubbing cast irons and folding laundry, I would curl up next to my girl and read. I would drink in Shauna's stories, her truths, and allow myself to rest. I am not exaggerating when I tell you the pages of this book are nourishing in a deeply profound way. "...I believe that Jesus asked for us to remember him during the breaking of the bread and the drinking of the wine every time, every meal, every day--no matter where we are, who we are, what we've done. If we only practice remembrance every time we take Communion at church, we miss three opportunities a day to remember. What a travesty! Eugene Peterson says that "to eyes that see, every bush is a burning bush." Yes, exactly. To those of us who believe that all of life is sacred, every crumb of bread and sip of wine is a Eucharist, a remembrance, a call to awareness of holiness right where we are. I want all of the holiness of the Eucharist to spill out beyond the church walls, out of the hands of priests and into the regular streets and sidewalks, into the hands of regular grubby people like you and me, onto our tables, in our kitchens and dining rooms and backyards.